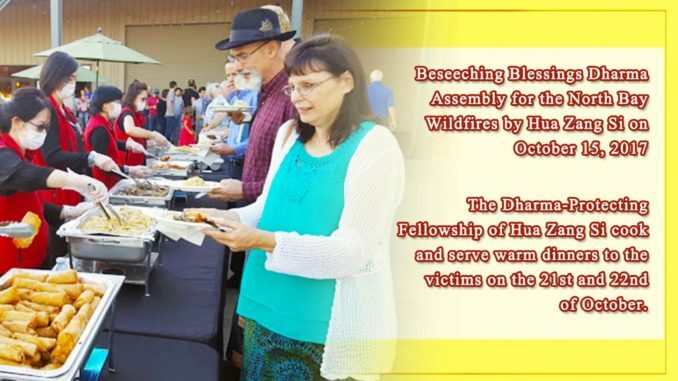 Beseeching Blessings Dharma Assembly for the North Bay Wildfires by Hua Zang Si on October 15, 2017 / The Dharma-Protecting Fellowship of Hua Zang Si cooked and served warm dinners to the victims on the 21st and 22nd of October. In the morning of October 9, massive fires broke out in the North Bay wine country counties including Napa, Sonoma, and Mendocino, causing severe casualties and wide-spread destructions and damages to residents’ homes. 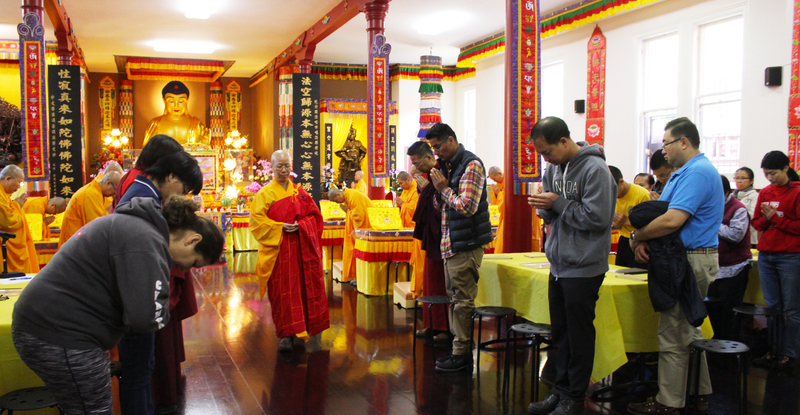 For the cause of benefiting the victims, Hua Zang Si held a Beseeching Blessings Dharma Assembly for the North Bay wildfires on October 15, 2017. “Regard all living beings as our families and parents!” Keeping the teaching of H.H. Dorje Chang Buddha III in mind, 26 volunteers in ten vehicles rushed over to the disaster-stricken area in Santa Rosa to deliver warmth and care on Oct 21, 2017, leaving early in the morning at 7:30 am. The vehicles were packed with cooking materials, propane tanks, and woks, etc. Among the volunteers were a college student and a high school student who joined their mothers. There were also husbands and wives, or whole families. Brother Sun who lived in the northwest of the impacted area provided his large house and backyard to be our preparation area. He also offered two bedrooms for the volunteers to rest. All volunteers have one thing in common: a compassionate heart. They did everything with care and love from beginning to the end, including planning the menu for two meals, where to shop, what to use, to determining the number of people served and meal time, and so on, which you could feel in every dish created and the smiles on their faces. The Spring Hills Community Church in the town kindly provided the facility for serving the dinners. The solemn church surrounded by red maple trees became shelter to more than 200 victims impacted by the North Bay wildfires. When fleeing from the fires, all they could grab with them was perhaps only a purse or a towel. Some even were in their pajamas. They left with empty hands and lost hope. At 6 pm on Oct. 21, the quiet church became bustling with people. More than ten volunteering brothers and sisters in red uniforms showed up with abundant food of a scrumptious dinner. They set up the warming trays along the side of the lawn. 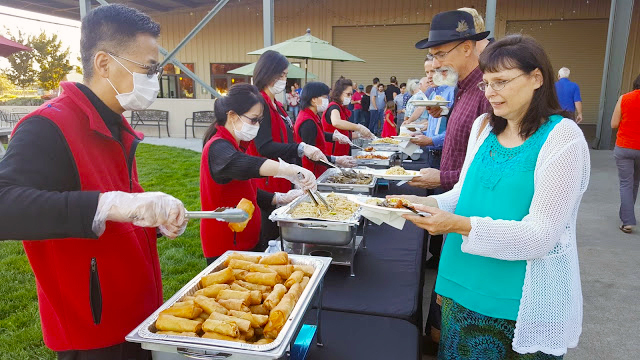 The chow mein, deep-fried egg rolls and wontons, stir-fry mix vegetables, fried rice and a couple of Chinese vegetarian dishes were all carefully planned and cooked. 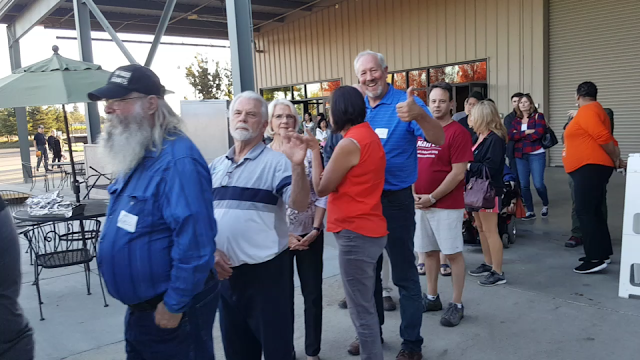 The line for the dinner, which stretched more than 200 meters, had more than 250 people. The victims were quiet, organized, and polite. When some were served more food, they actually told the servers, “There are more people behind me, take out some food so there will be enough for them.” After the meal, they all came to shake hands and hug the volunteers to express their thanks. They praised the meal as the best Chinese food they have ever had. In more than two hours from the sunset to when the lights turned on, all meals were served. We then saw the open-heart smiles from the faces of the victims who were trying to settle down after the disaster. They estimated that about 100 people would come the next day. However, more than 200 people showed up. The volunteers still had enough food for the crowd. When the victims learned that that would be the last time to serve such a dinner, they all came to take pictures and say goodbye. A lady there said that this was her first time to taste such delicious egg rolls. Her husband never liked egg rolls, yet, that day for the first time, he ate two. What is the story behind the delicious food of love? During the two consecutive days, the volunteers stood in the cold in their thick winter jackets in the early morning. They picked, washed, and cut the vegetables and then they started to turn on the wok to steam, boil, and stir fry. At noon, however, in the blazing sun, the sweats poured down their cheeks even when they only wore T-shirts. In the heat, the brothers and sisters did not hesitate at all especially when they were standing by the hot wok deep frying the egg rolls and stir frying the vegetables and noodles. All of them worked together until after 5 pm which was time to load the food in the cars for serving at the church. The volunteers brought three big woks, four long tables, ingredients and all cooking tools from San Francisco, but not chairs for themselves. They said that they wanted to reserve more space for food and tools. Also, when the brothers went to purchase the cooking ingredients, they experienced a touching moment. When the Chinese owner of Fresh Green Inc. learned that the food would be used to serve the victims, without another thought, he decided to donate several dozens of boxes of cooking ingredients for this cause. Resolves come from intentions and intentions will grow into faith which will help us to attain accomplishment. When our heart goes out to others, when we feel the pain of the families in disasters, we then learn to appreciate the fortune we have now and will do things that will increase our fortune. 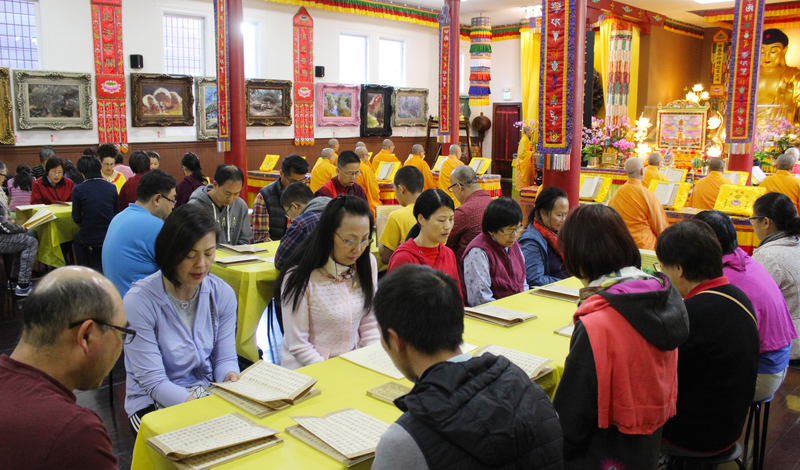 Thinking back about the Beseeching Blessings Dharma Assembly for the victims of the North Bay wildfires held by Hua Zang Si on October 15, Abbess Dharma Master Ruo Hui gave a speech at the end of the ceremony: “All should do what they can to help out. Help the victims as if you are helping your own families. Help them to walk out of their grieving. Bring them health, peace, and happiness.” After the event, many attendees made donations. Right there, the Dharma-Protecting Fellowship took the initiative and expressed their intentions to the abbess to put together a project to help the victims. A week has passed since the disaster-relief effort with love and care. Those touching moments still flash before my eyes. Through the volunteering project, all united together and manifested the teamwork spirit to the utmost. The project was like a big family reunion. There, they worked together and expressed their care for each other and more. They did that with joy in their heart and felt fulfilled. Wildfires, Houses, Red maple leaves, and the Church, all things in the world are conditional and subject to impermanence. Look up at the birds flying by the church. They passed. Yet, they left no trace behind. May the compassion of all Buddhas and Bodhisattvas empower all of our parents to leave their sufferings and experience prosperity and auspiciousness!